Review: Paul Fredrick* - CounterCultural. CounterCouture. Last month I was contacted by a designer and retailer that I had never heard of before to write a post for the forthcoming fashion season. However, Paul Fredrick are a men’s retailer with a specialism in suits with a sporty bent; an area of fashion that I have very little knowledge of. Fortunately, I have two wonderful friends in James and Jake who were more than willing to give me their opinions on Paul Fredrick and the topics suggested. I was given five topics to pick from for the post. Fortunately Jake and James gave me a wide breath to pick from so I’m going to turn it over to them now. Though I do myself dress formal-casual most of the time, these casual shirts do not appeal to me, I am perhaps a little younger than the target demographic. I think they look more suitable for middle-aged men aspiring to look more youthful. I do like the blue blazer, however I am not a fan of white buttons nor the white trousers. Personally, I like shirts which are bright, clean colours. The sort that can still be comfortably worn without a tie. 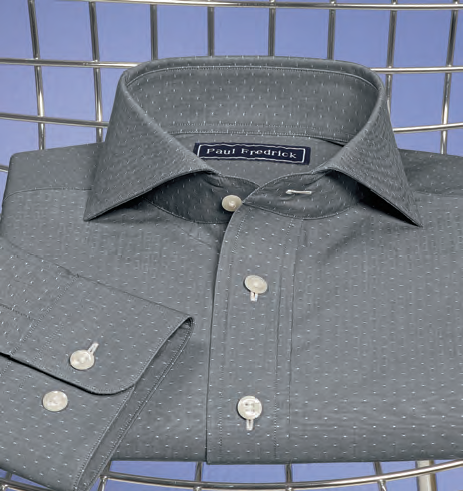 Otherwise, if plain and white, subtle patterns can give a shirt its edge by texturing it. Match on a few colours, compliment on others. Flashes of the same colour on different parts of the outfit. Keep the tone similar – e.g. both wear muted colours, or vibrant, or a mix, but do the same across both. Whites in winter and summer, bright colour throughout the year, muted colours during spring and autumn. Belts, scarves, watches – colour should be similar. I like minimalist looks, so would suggest keeping the designs fairly simple and elegant, so they aren’t tied to too few looks but can be mixed and matched. Wear something cohesive. If possible, go for a clean look. Find a way to show you’re not simply focusing on the main parts of your outfits by showing flair elsewhere; wear exciting socks, get a piercing, paint your nails. Okay, so I have literally copy-and-pasted their emails but it’s always better to let someone talk for themselves. James, though a consistent wearer of suits, was not a fan of the checked shirts or the white buttons. I’m afraid that I do agree with him on the blue blazer, as it seems very typical of the preppy side of the USA. Then again, Paul Fredrick is an American label so I can understand this slight twist to a standard blazer. The headings for each of Jake’s comments are based on the five topics that I was asked to comment on. 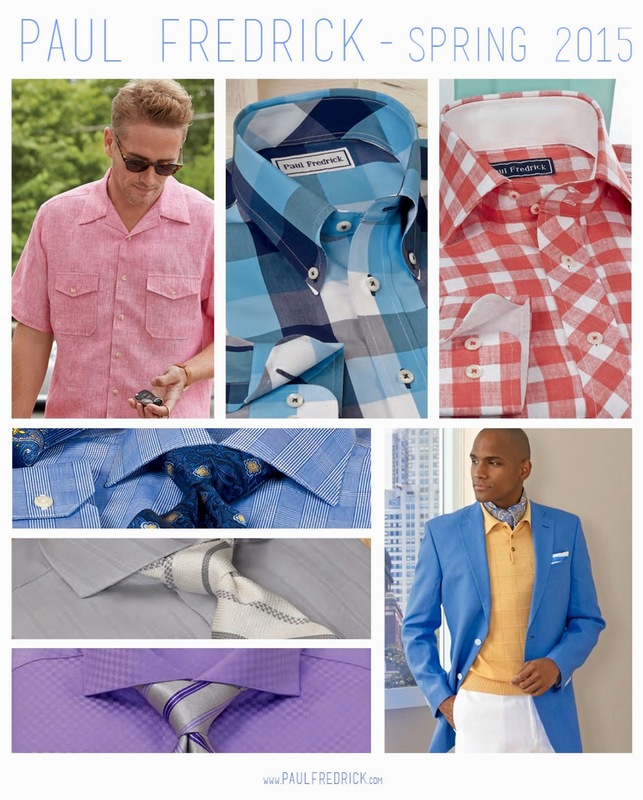 I agree with his choice of dress shirts, though I do favour purples and navy shirts as well. This grey shirt in particular would be great for smart-casual or even business suit. A little different to the normal white shirt. Equally true is that the best way to coordinate outfits is to match complimenting colours. However, that is where the similarities stop between Jake and I. I probably stick far closer to the traditional seasons with pastels and brights for spring/summer, turning into muted mustards and burgundies in autumn with black and sparkles reigning supreme in winter. And don’t even start me on florals, tribal, folk and grunge pattern trends across the seasons. Accessories for me are the best way to stand out, combining the last two points together. (Another post on how to stand out with accessories will be coming shortly.) Essentially, as a fan of relatively plain clothes in bright or dark colours, accessories are how I add interest to any outfit. Don’t overcrowd it but you don’t have to go minimalist. Whether it’s a slogan bag in a colour that purposefully clashes or a chunky necklace that breaks up a top, catch people’s eye with something a bit different. …Also, I must see how much those chilli cufflinks are. Just the thing for a man who likes it hot! The post Review: Paul Fredrick first appeared on CounterCultural. CounterCouture. *This was post was the idea of Paul Fredrick who approached me. All opinions are my own unless otherwise stated.